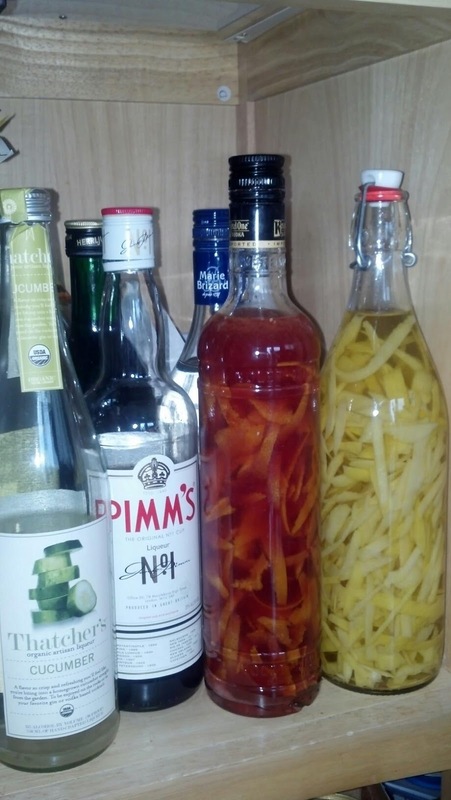 From Scratch: Drink Your Citrus! Some of you may follow From Scratch on Twitter or Facebook, and you might remember that I was experimenting a couple of months ago with making my own limoncello and blood orangecello. Which was one of those ideas that could either turn out awesome or a horrible failure, with very little in-between. 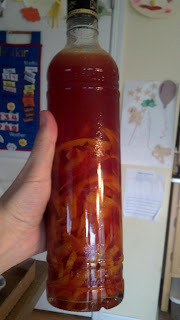 I'm happy to say that, at least as far as the blood orangecello goes, it was a huge success! So, I'm proud to share my method with you, so that you too can get a delicious, orangy (or whatever flavor you decide to try) buzz from your own homemade liquor. I started by googling "homemade limoncello". I know, total creative genius. But, as it turns out, there are at least 487,000 different recipes on the internet in English for "homemade limoncello". Huh. So, not as easy as I thought. Some of these called for Everclear. Which my well-stocked liquor cabinet does not have. And I was feeling too thrifty (i.e. cheap and lazy) to go out and buy some. We did, however, have an overabundance of vodka, as a couple of friends of ours always seem to come over with a new bottle, drink a couple of drinks, and then leave the rest at our house. Some of the recipes mentioned that you could substitute vodka for the Everclear, so good to go there. So, I took 8 blood oranges and peeled them with a vegetable peeler. They didn't seem to be too insulted, even though they are a fruit. With the peeling, I went back through the peels with a sharp knife and removed the white pith. From what I understand, this pith would make the final product bitter, and I didn't want that. It's a long task, but trust me, the end result makes it pay off. Okay, technically this is a lemon, because I forgot to take pictures of the oranges. Oops. After peeling the oranges, I sliced them in half and squeezed the juice, saving it to the side. Then I took the peels and slice them into thin pieces so that they would easily fit into an empty bottle with a sealing top. I put the peels, the reserved juice, and about 1/2 cup of sugar into the bottle, and then filled it the rest of the way with vodka. Then I waited. And shook my bottle every day. Well, every day that I remembered to, at least. And then I waited more. It hug out in my liquor cabinet with some very good company for over a month, until I just couldn't take it anymore. I took the bottle out, grabbed my fine mesh strainer and a pitcher, and strained my concoction. The end product was a great color, and smelled fantastic, like boozy orange trees on an Italian coastline orchard at sunset. Naturally, I had to try a sip or 5. Not gonna lie, the first sip kind of burned, but the flavor was amazing! By the second sip, it didn't burn half as much, but this is potent stuff. Best if taken in small doses, or mixed in with other things. A clear sparkling drink (lemon-lime, ginger ale, sparkling waiter, sparkling wine) would probably be very refreshing with it. I think it will also go well in my favorite use for limoncello, mixed with some whole cream. I poured it into a mason jar and now it's in my freezer, nice and cold, waiting for me whenever I need an orangey escape from the day. The alcohol will keep it from freezing, although I have found that the juice in it makes it just a tidge slushy. But that's not necessarily a bad thing. I made the limoncello with a totally different method, so I'm looking forward to fixing that up and seeing how the two compare, but this blood orangecello was a great success! You can try it with just about any citrus you'd like. I'm pretty sure this won't be my last foray into homemade liquor. Cheers! Hey Ellen! It's Katie from good old UHall 4B in 01-02. You were my RA! :) I'm loving your blog, even though I'm a catastrophe in the kitchen. Slushy blood oragecello sounds divine!